We have had our first report of ambrosia beetle emergence in a Brooks County orchard in the begging of February. Young, stressed trees, particularly those planted in poorly drained soil, newly-cleared sites, and those planted within the last week and undergoing transplant shock in this warm weather are particularly at risk. If you have had problems with these pests in the past consider spraying or monitoring for the beetles in your own orchard. Traps can be placed in orchards at this time to detect emergence at individual sites. See here for details on making ambrosia beetle traps. These traps are for monitoring purposes only and tell you when you may need to start spraying. Once the flight starts pyrethroids are the only method of defense and this provides only short-term protection. Pyrethroids are short-lived in the environment and make re-application necessary. Repeat applications will be necessary every 7-10 days or after rainfall. If attacks are detected trunk sprays must be applied quickly to save the tree. 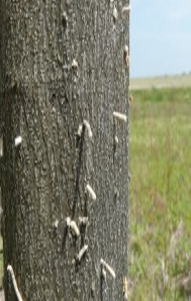 The more ambrosia beetle hits are found on a tree, the less likely the trees are to survive the attack. You may want to remove tree guards or tubes for better observance of beetle attacks. Posted in Pecans. This entry was tagged Ambrosia Beetle, Pecans. Bookmark the permalink. Next: When is Best to Burndown Cover?